You see that leaf of basil up there? I wish that was ME! Why? Because it is 100F, and that soup is COLD. 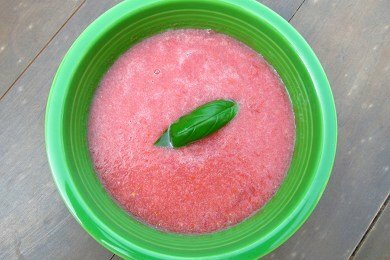 While you would never make a cold soup in January, grab the moment and serve this refreshing watermelon and tomato soup. I was inspired to try this from a New York Times article that referenced "The New Spanish Table" by Anya von Bremzen (see below). This book is a wonderful collection of recipes from Spain and with a little adjustment (removing 1/4 cup olive oil) - I made this recipe into a super healthy soup. All you do is puree tomatoes, watermelon, lemon juice, and celery in a blender and chill. No cooking required! My 7 year old daughter pointed out that you could now drink this like a smoothie and proceeded to pour herself some. She is getting too big! My in-laws, who are visiting right now, said that they liked the soup without salt or pepper. And, me? I loved the basil, salt, pepper, and I drizzled about a teaspoon of olive oil to give the soup a bit more depth of flavor. The olive oil is not included in the nutrition facts below - but it is 120 calories per tablespoon so if you start pouring it all over the place - the calories increase dramatically. Some would argue that the taste also increases in deliciousness dramatically. This is a great addition to any summer barbecue because it can be made ahead and your guests will love you for helping them chill. Wow, sounds good and really easy. I am trying to figure out if it would be sweet and salty and sour all together or what the main taste would be. I wish I had a machine to puree things! OOOOOH! I could do really "doctor this up"...feta cheese, and mint, with a little olive oil..wonder if the olive oil helps it emulsify, making it richer?...hmm Thanks for the idea!! Cool, it's a soup I thought its a smoothie.. I would try to prepare this soon, pretty interesting. And also do try melon soup its actually delicious too. by seeding the tomatoes do you mean to remove the seeds? I've been making this soup for a few years now, in fact, just made it yesterday! Fresh garden tomatoes are a must. My recipe calls for a cucumber (seeded)instead of celery, lime juice instead of lemon, fresh basil, and a small jalapeno pepper. I peel the tomatoes since I don't like the little pieces of peel left when I blend it :-( but don't seed them as I read that a lot of flavor is in the jell around the seeds. It seems to get better each day, so I don't begin to eat it until the day after I make it. If serving to guests, I serve in a glass cup with a pretty etched design with a slice of lemon/lime - a very attractive presentation!